Amzphoto.com » Photography Foundations » Photography Fundamentals » What Is Macro Photography and How to Take Macro Pictures? 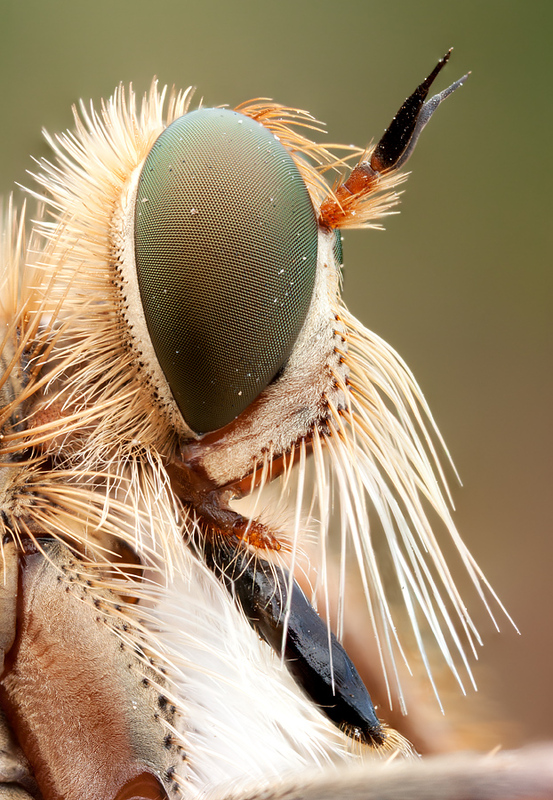 In simplest terms, macro photography is shooting your subjects from a close distance. 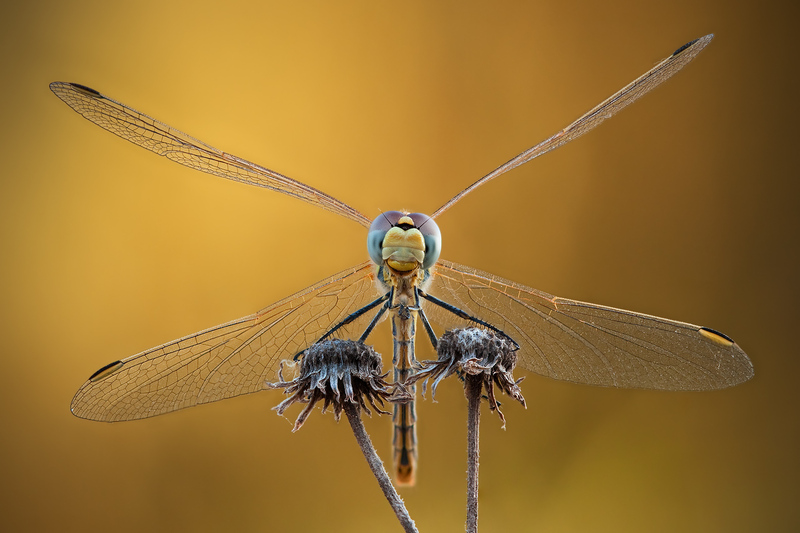 Macro photography is one of the most popular forms of photography, and with good reason. It is easily accessible, and it is a very broad genre of photography. Studio pros can enjoy taking macro shots of leaves, flowers, and sluggish insects, maintaining total control over lighting. Nature lovers can spend hours outside, searching for hidden treasures among flowers and leaves. Plus, in non-photogenic locations, like many people’s backyards, macro photography makes it possible to take great images of nature without traveling at all. Some of the greatest challenges in macro photography arise from the simple fact that we shoot from very close distances. Thus the magnification of our subject becomes of primary importance. To understand the concept of magnification, it's worth taking a very brief look at how a photographic image is created. Every point in a given scene reflects light rays. The front element of the camera lens 'captures' these rays and then focuses them onto the imaging sensor, producing a projection of the scene at the location of the sensor. This is a simplified diagram of the photographic process. Light rays reflected from an object pass through a lens, which then produces an image projection on the camera's sensor. 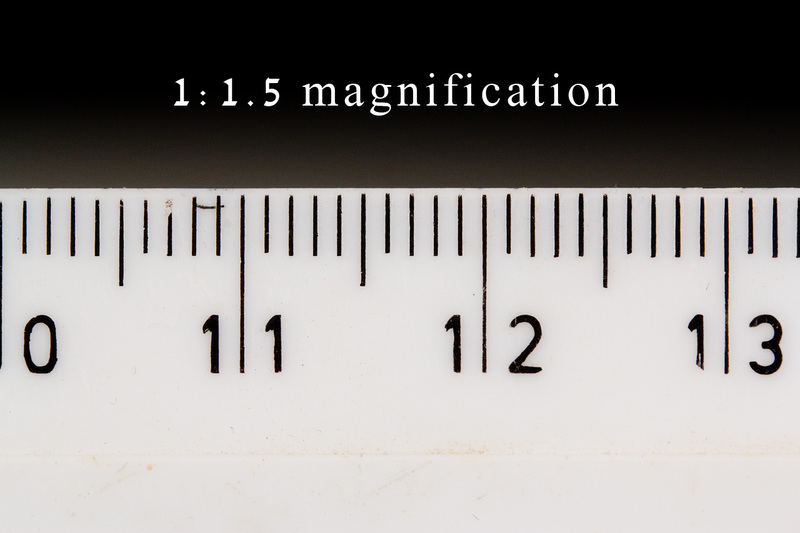 Magnification - or more precisely, the magnification ratio - is simply the relationship between of the size of the (in-focus) subject's projection on the imaging sensor and the subject's size in reality. Perplexed? Here are some examples. Suppose that we're photographing a small child, 1 meter in height. Imagine that the height of the child's projection onto the sensor is 1cm. The magnification ratio is 1cm/100cm, or 1/100. 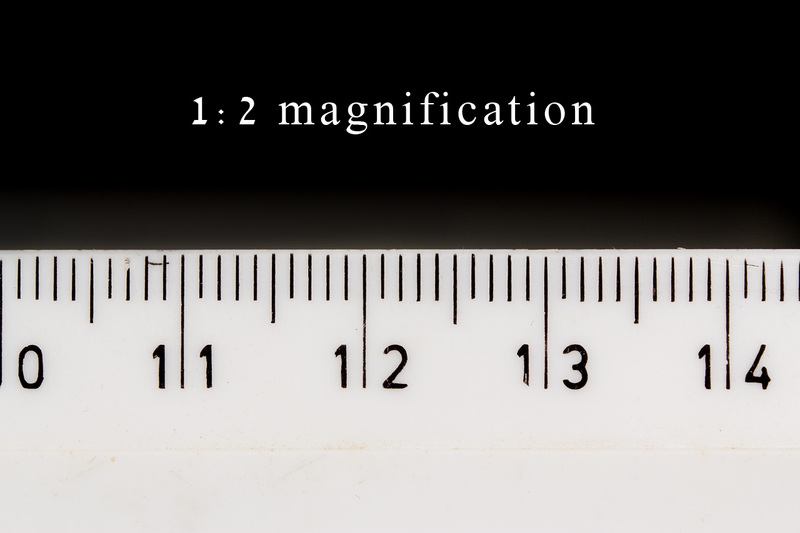 Magnification is typically notated using a colon, so we write it as 1:100, and pronounce it, 'one to one hundred', meaning the child is 100 times larger in real life than its image as projected on the sensor. Similarly, if the subject is a 10cm long lizard, and its projection on the sensor is 2cm long, the magnification ratio is 2cm/10cm or 1:5. The lizard is five times larger in real life than its projection on the sensor. When your subject(s) fills the frame with no cropping involved, it is easy to determine the magnification ratio from a captured image provided you know the size of your subject and the dimensions of your camera's sensor, which can be found in the specifications section of the user manual. 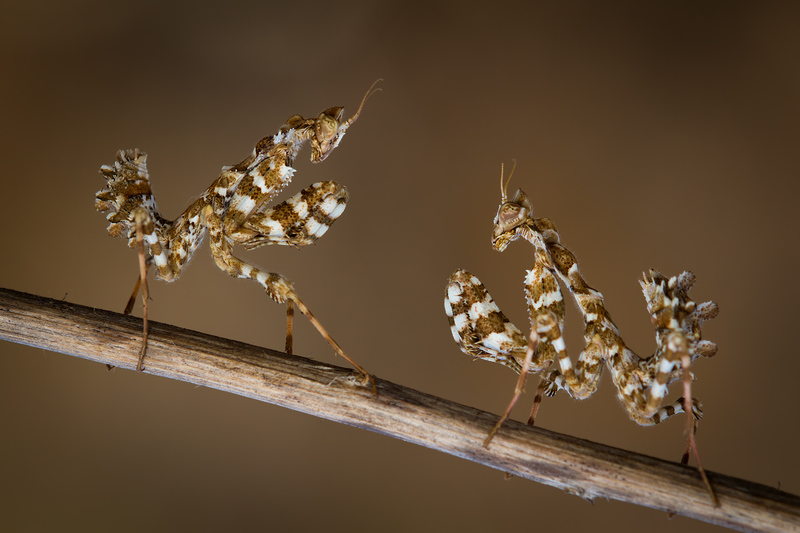 Two thistle mantis (Blepharopsis mendica) nymphs, as positioned above are roughly 150mm across. The sensor on the camera is 22mm across. The magnification ratio is approximately 22mm/150mm, or 1:6.8. This dragonfly is about 60mm in width. Again, the sensor is 22mm wide, so the magnification ratio is 22mm/60mm, approximately 1:2.7. We've seen in the examples above that sensor size can be used to calculate magnification, but the degree of magnification itself depends on focal length and subject distance exclusively (assuming that the lens is not used with any extenders or magnifying filters). Sensor size does not alter magnification. With a fixed focal length and subject distance, an APS-C sensor, for example would just crop the frame compared to a full-frame sensor, not enlarge it. Magnification is a property of the projection, regardless of the size of sensor (or film format) you are using. With a full frame sensor you'd just make calculations using 35mm as the sensor width instead of 22mm, but the subject would then be proportionally larger, cancelling out the sensor size difference. Sensor size does have an effect on the image's appearance though, a topic I will address in an upcoming article. What happens if the subject is the same size in real life as its projection? If we shoot a 1cm fly and its projection on the sensor measures 1cm as well, the magnification is 1:1. The 1:1 ratio has an important meaning for macro enthusiasts. Technically speaking, macro photography means shooting at a magnification ratio of at least 1:1. Therefore, a 'true' macro lens has the ability to produce a magnification ratio of 1:1, or higher. 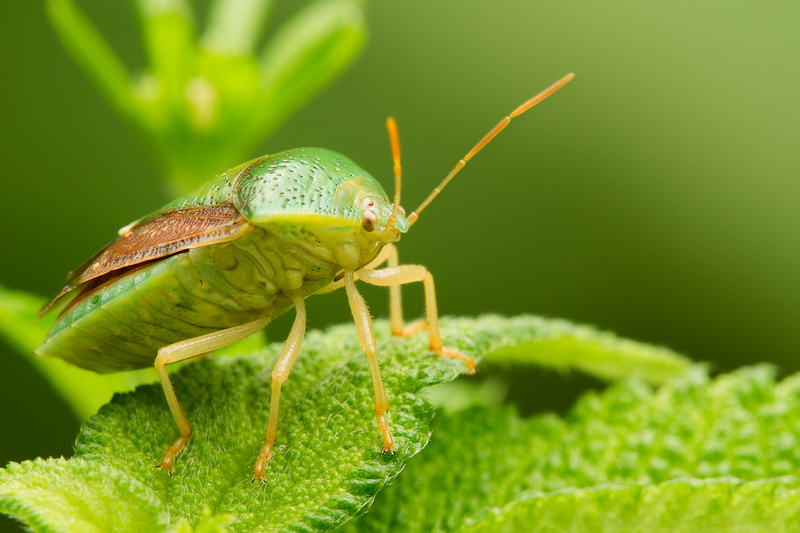 A small subject like this shield bug required approximately a 1:1 magnification. At this point you may understandably ask, what's so special about a macro lens? Surely one can take any old 50mm f/1.8 lens and just move it closer to your subject until you reach 1:1 magnification. The problem, however, is that a regular lens will not be able to focus at such close distances. A more specific definition of a macro lens, then, is one whose minimal focus distance is short enough to allow photography of a focused subject in 1:1 magnification. Let me take this opportunity to point out that many lens makers employ a very liberal use of the term, and happily write 'macro' on a variety of zoom and prime lenses that are not capable of 1:1 magnifications. This is a sales tactic, and you can easily find so-called macro lenses that can only produce 1:4 or 1:3 magnification ratios. One can, of course, produce great results with such lenses, and it is often possible to achieve higher magnifications on these lenses with the use of optional accessories. When shopping for a macro lens, however, you'll want to look carefully at the magnification specs; most 'true' macro lenses will actually have 'macro 1:1' prominently displayed on the barrel. That removes any ambiguity. Once you have a macro lens, how do you accurately calculate its level of magnification at an arbitrary focus distance? The easiest way, by far, is to use a ruler, as shown in the examples below. I photographed the ruler from a measured subject to sensor distance of approximately 65cm. Forty-four 1mm notches fill the entire width of the frame, thus the subject's projected size is 44mm. The width of my camera's sensor is 22mm. It follows then that for this lens, the magnification ratio achieved at this focal distance is 22mm/44mm, or 1:2. In this image I moved the camera closer so that now thirty-three 1mm notches are visible in the frame. This 22mm/33mm relationship yields a magnification ratio of 1:1.5. Finally, by moving the camera even closer, twenty-two 1mm notches are visible in the frame. As you'd expect, 22mm/22mm equals a 1:1 magnification ratio. I should point out that with a regular macro lens, 1:1 magnification is achievable only at the very closest focus distance. Using a longer focus distance necessarily means the magnification will be lower. Indeed, for a fixed focal length, magnification is inversely related to subject distance. This relationship isn't linear, i.e. if I get a 1:4 magnification from a shooting distance of 40 cm, I won't necessarily get a magnification of 1:2 (twice that) from a shooting distance of 20cm. However, getting closer will always result in a larger magnification and vice versa, meaning that for our purposes we can use the terms magnification and proximity somewhat interchangeably. that the image projected on my camera's sensor was 4x larger than the fly itself. 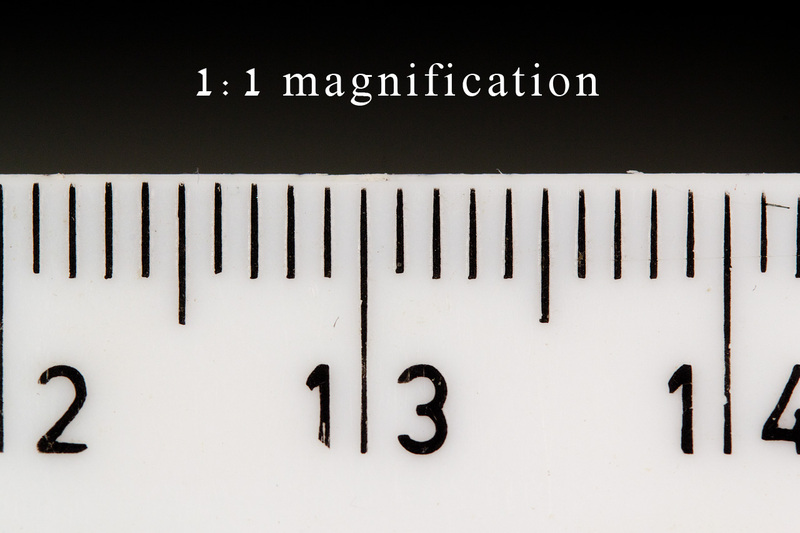 There are cases (such as the image above) where we wish to shoot at magnifications greater than 1:1. 0.25x magnification means you can focus close enough so anything you are photographing can end up as large as 1/4 life size. In other words, if your sensor is 22.2mm wide (Canon APS-C sensor width) then at the closest focusing distance, something that is 22.2mm wide will fill 1/4 of the width of your photo. OR something that is 88.8mm wide will fill the entire width of your photo.